When CIA operative Tracie Tanner is entrusted with a Top Secret communique from Mikhail Gorbachev to Ronald Reagan, she is confident in her ability to successfully transport it from Russia to Washington, D.C. But things don't go as planned, and soon she finds herself in Maine with no official support at all. The only one there to help is an air traffic controller with a brain tumor! 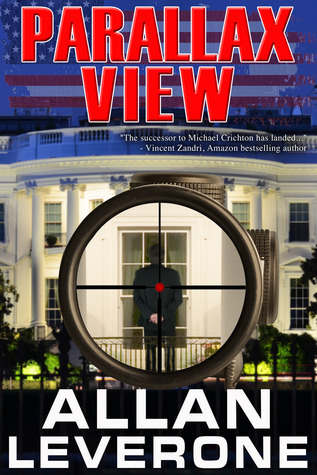 Parallax View by Allan Leverone brings us back to 1987, when the world was on the verge of massive change. It's a fast-paced thriller that kept me on the edge of my seat from beginning to end. What I love about Leverone's writing is that he develops characters that seem so real and easy to care about. Shane Rowley, the air traffic controller who joins Tracie on her journey, is such a character. He's just an average guy who happens to be in the wrong place at the wrong time. He may end up doing extraordinary things, but in the end, he really is just an average guy. I love thrillers and Parallax View was really fun to read. I enjoyed the characters and the storyline. It had intrigue, interesting relationships and an exciting finale. If you're looking for a fun thriller, definitely check it out. This review was written based on a copy of Parallax View that I received from Pump Up Your Book in exchange for an honest review.